Fascinating vignettes about the men and woman who ruled Pakistan What did Muhammad Ali Jinnah say when he received a royal salute from the last British regiment about to leave Pakistan? Did Ayub Khan consider turning Pakistan into a monarchy? Why was Yahya Khan so confident that the 1970 elections would return a hung parliament? What did Zulfikar Ali Bhutto say when the Pakistan Army launched a brutal crackdown in March 1971? How did Zia-ul-Haq get Bhutto to appoint him the army chief? In 2007, did Benazir Bhutto misread the extent of American support for her return to Pakistan? Had Pervez Musharraf and Nawaz Sharif agreed to a pull-out from Kargil even before the latter went to meet President Clinton in July 1999? 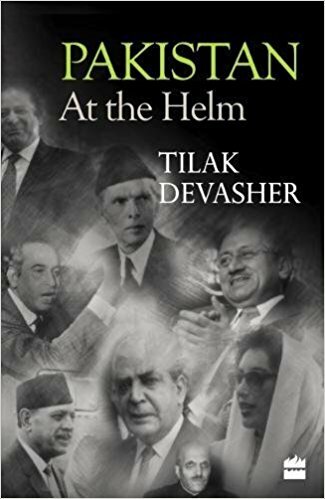 Backed by meticulous research, the second book from Tilak Devasher, author of Pakistan: Courting the Abyss, provides enthralling insights into the lives and times of the leaders of Pakistan over the seven decades of the nation's existence. Anecdotal and engrossing, Pakistan: At the Helm presents a human side to the country's political history for anyone who is curious about the inner workings of its corridors of power. Tilak Devasher retired from the cabinet secretariat, Government of India, as special secretary in 2014. His first book, Pakistan: Courting the Abyss, was published by HarperCollins India in 2016. During his professional career with the cabinet secretariat, he specialized in security issues pertaining to India's neighbourhood, with special focus on Pakistan, Afghanistan and Bangladesh.